It is wedding season! Which if you come from a big family, that means party after party! I love a good wedding (hint hint would love to have a side hustle in the wedding industry on day). 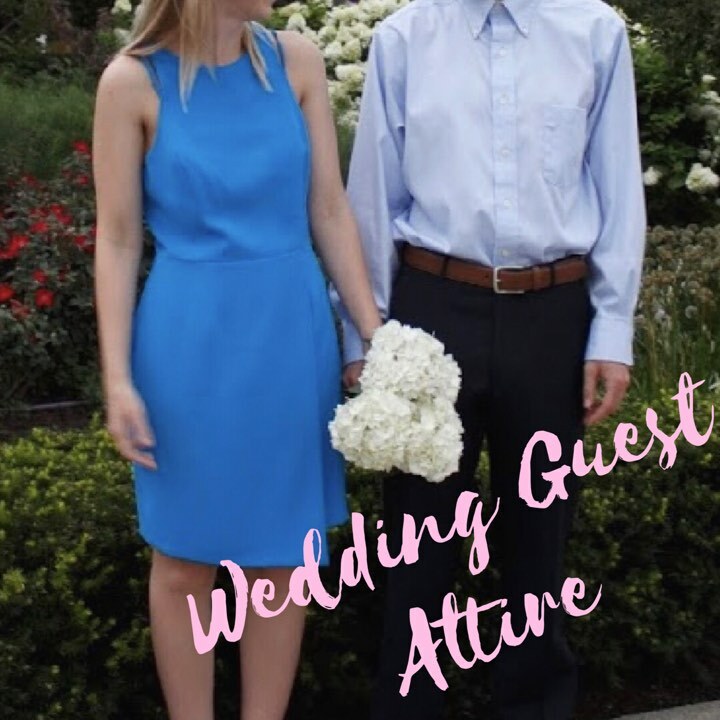 With wedding invitations rolling in what are you thinking about as a guest? What to wear, of course! And sistah to sistah sometimes it those type of events can sneak up on you. So here I am to help you out on exactly what should be worn to what event. Because wedding events are like people they are totally different! Question: Can you wear black to a wedding? Personally, I would avoid it. However, yes you can go for it. There is nothing against wearing black, it will help you blend. At the same time, there are so many other options that you can go for. I would avoid anything a little too pastel/ almost white. You never know what the bride will go for. A blush or light blue have been popular choices for modern brides. Destination Wedding// Does anyone secretly really love these so you have an excuse to go on a vacation. This will be a more casual wedding if it is on a beach. I would say wear sandals and wear a fun laid back attire. The Plus One// We have all been there. You are a plus one to a wedding you know 1 person, your date. Here is the trick, keep it as simplistic as possible. You are there to celebrate the couple, but also there to support your significant other. That means keep it as minimalist as possible. 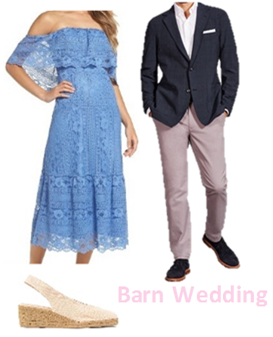 Keep the dress a solid color (not anything going along with the wedding theme colors), keep the accessories simplistic, and just a pro tip make sure the shoes are broken in. This night is not by any means about you. Be able to blend in and offer to take a picture or two. Rustic Barn Wedding// This is such a popular wedding trend right now. However when I think of this trend, I think of no AC. That means have a light and airy feel to your attire. Also because it is an outside wedding make sure that your outfit is functional. I paired this Boho dress with this more casual suit. Black Tie/ Black Tie Optional// This is hands down my favorite of weddings. You can wear a long dress this should be more simple. Where if you wear a short dress it can be a little more dramatic. I paired this with a more fun outfit and a classic suit. 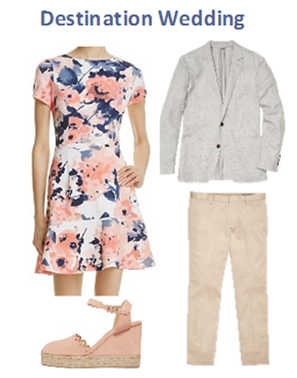 Rock it out for wedding season! Enjoy the loved ones, and can't wait to see some good pictures. Hope everyone has a good wedding season! I love these options for men's suits, especially the light colored one! My husband needs a new option.